I am creating them! MWAHahaha! I am working on an EDURPG model inspired by a little Dungeons and Dragons and a bit of Skyrim. A Quick Shout out to Mr. Matera (@MrMatera) who helped me get all of this rolling in our WellplayedU Podcast discussion on Boss Fights. Check it out HERE. I think this might be a variation on what he talked about in his class. At some point in each class student guilds will be attacked by one of the enemies on this list. I have printed and laminated each enemies’ card and just put it on the guild’s table grouping when the battle begins. Guilds are between 3 and 5 members and each member of the guild has a “Type” such as Healer, Warrior, or Sorcerer. These guild member types have different strengths and special abilities. 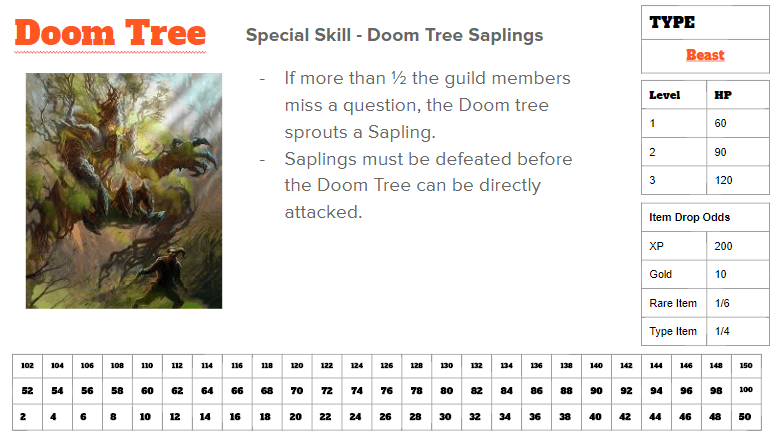 The guild member’s attack strength is based on their “strength level” and dice rolls (more on this soon), but in order to attack the guild member has to first get a review question correct. The attack takes points off of the enemy’s Hit Points (HP). At the beginning of the semester the enemies HP are at Level 1 as indicated in the box on the left but as the semester goes on the monsters will get stronger as the students’ avatars get stronger. As you flip through the various enemies this mechanic becomes more clear. In order to keep track of the HP the enemy loses during the battle I have included a table at the bottom of each slide. I have printed off each enemy and laminated their card. Students simply use a dry erase marker to mark off their attacks on the table at the bottom. Will they cheat? Maybe, but I have at most 5 guilds and circulate around the room and since this is not tied to their grades there is less incentive to do so. You may notice a few other things on the cards. First, each enemy has a special skill. Novelty and Variety are pretty important when it comes to battle mechanics. When I had time to play video games like Final Fantasy each new area opened up a new set of monsters to fight. Part of the fun was seeing the new twists on the battle mechanics based on the new enemy types. Within the Special Skills you may notice a reference to the Guild “Classes”. At the beginning of the semester each guild selected one of five “Class” categories – Seeker, Barbarian, Paladin, Swordmage, or Ranger. These “classes” are stronger or weaker against certain types of monsters and this comes up in the special skill sections. (Again, this will come in another post). The Monsters come in 5 different “Types” as well as indicated in the upper right hand box. There are Paranormal, Beasts, Draconian, Darkness, and Elementals. 10 different monsters in each type makes a total of 50 different enemies! Here is my favorite twist on all of this – each section of the room is home to a different monster type. Each guild class has strengths and vulnerabilities to the different enemy types. Which brings me to the Item Odds section – the bottom right hand table on the cards. If the guild defeats the enemy all non-KO’d members (more on this too!) will receive XP, gold, and items. They will roll the percentage die (10 sided & multiples of 10). This first roll will tell them the percentage of the number on the table they receive for XP and gold. For example, the Stink Ghoul has XP = 100 and Gold = 50 and the guild member rolls a 50 on the percentage die. That student would get 50XP and 25 gold. The Rare line shows the odds of getting an item designated rare (like a Talisman of Health) and Type line shows odds of the enemy dropping an enemy specific item (like a Beast type dropping a Talon or a Dragon leaving Dragon Scales). For these lines they will roll the die with the denominator number. For example, that Stink Ghoul has 1/10 odds of dropping a rare item. The student would roll the 10 sided die. If they roll a 1 they would get a rare item. Same for the Type Drop. The Stink Ghoul has 1/6 odds of dropping a Paranormal item so the student has to get a 1 when rolling a 6 sided die. That sounds way complicated now that I’ve written it out, but we have played a couple of rounds in class and the students picked it up quickly. I even play tested it with my 7 year old over Winter Break using his math homework and it quickly became his favorite game. The Doom Tree and Boulder Bug were his two favorite. There is a ton more to share and I will be doing so in a new EDURPG series I will be rolling out on the blog over the next couple of weeks. Please feel free to leave a comment on the Enemies. It was mind-racking think of all the special skills so I would LOVE more ideas!